They say diamonds are a girl’s best friend, but they’ve never met my horse! For sparkle, shine, and simple elegance, you can’t beat diamond horse jewelry. Gold horse jewelry with diamonds ranks high on many equestrienne’s list of favorite things. This week, we’d like to take a look at some of our favorite diamond horse jewelry pieces and discuss what makes each one so special. We love diamond horse earrings. Gold stirrup horse earrings with small diamonds are fabulous for everyday wear. They work in every environment – the barn, the office, out on the town. During eventing season, we see these earrings being worn by a lot of people – it’s a simple style everyone loves. Diamonds are considered to be a very romantic stone. After all, it’s a diamond that traditionally has a role of honor in an engagement ring. If you’re searching for romantic horse jewelry with diamonds – without having to pop the question – diamond horse earrings are the way to. Diamond horse pendants also work well in this situation. 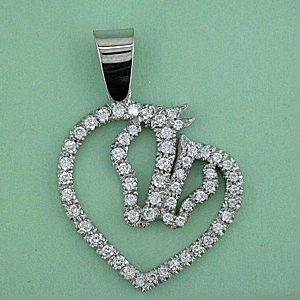 When buying diamond horse jewelry, remember that the quality of the diamond is always more important than the size. It is better to have a high quality small stone than a low quality large stone. Vintage horse jewelry often features diamonds used to accent a horse’s eyes or bridle. These diamonds may be small, but they should be high quality for the best sparkle and shine. When you’re buying fine horse jewelry online, you want to work with a jeweler you know and trust. It’s important to know you can feel comfortable with your purchase. That’s why we welcome and encourage questions about our merchandise. We want you to know exactly what you’re getting – that’s the key to customer satisfaction. Whether you’re searching for a gift or adding a piece of fine horse jewelry to your personal collection, we’re here to help!